This is my very own Green Man, who protects my garden against evil spirits and malignant fairies. The spate of burglaries we experienced in this street also abruptly came to an end when I set him to guard the property a couple of years ago. The security light may have helped as well, but I put most of the mist of tranquillity which has settled on my home and garden recently down to the beneficent magical influence of this totem. A synergy of John Barleycorn, Jack in the Green and other sprites of rural English folklore, The Green Man’s roots actually go back several millennia, and once you’re on the lookout you can find his image all over the place. His influence on Christianity is evident from the fact that his mischievous and rather complacent face peers down at you from the interiors of most cathedrals, usually up in the vaulting, right across Europe and especially in Germany. There are supposed to be a hundred Green Men in the Templar church of Roslin Chapel near Edinburgh alone, although the exact figure remains problematic because nobody can count them for some dark and esoteric reason. 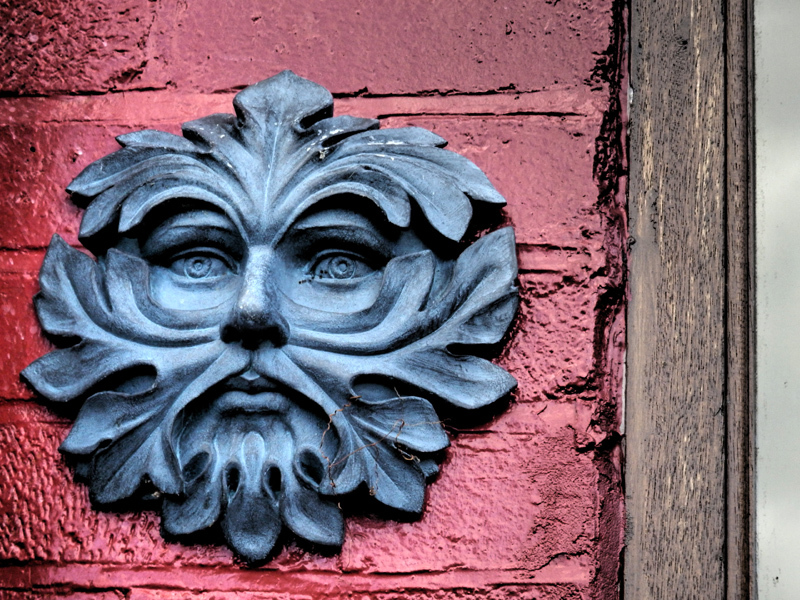 A potent symbol of resurrection and the cycle of the seasons, and worlds away from the technology we all get so excited about these days, the lovable Green Man was one of the few pagan icons to survive the onslaught of Christianity. Along with the cat (cats belong to no one), he’s the perfect custodian of my semi-wild garden.